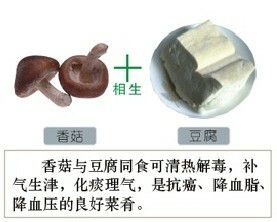 Welcome to the third article based on the Xiangsheng Xiangke food chart that I posted in the “Foods that React to Each other“. Today we continue to cover combinations of food that are naturally healthy on their own, but Chinese traditions (and TCM) suggest they react to each other in various ways. Let’s start with a positive combination. It’s nice to be home! And I’ve been cooking various dishes to show my family that it is easy to cook healthy Asian food, one of the purposes of creating AsianLiving.me! The first lunch I made included my now infamous Pork Ribs with Garlic and Black Bean Sauce, with spicy Toufu, and Spinach Greens. 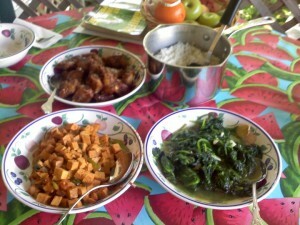 It was the first time my family had tried these dishes made at home, rather than at a restaurant. “Chee” is one of those concepts that floats around in the English-speaking world, but is rarely understood outside of its cultural context. I’ve written about this before in Ginseng and Ginger posts. There are loads of potential benefits to your health if you consider Qi in your daily life. But, first we need to get an understanding of the meaning of the word “Qi” and then we can drape more layers of meaning on top of that. After all, language defines culture and allows it to breath, which is not too far away from the literal meaning of Qi. Meanings: Air, gas, breath, mood, smell, manner, anger, etc. 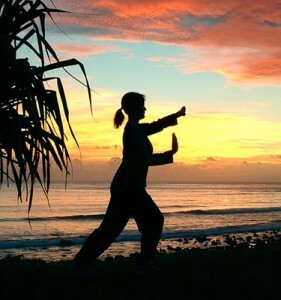 The more familiar of the two Qis (mmmm, cheese…) is something called “Qi Gong” 气功 – literally “air” + “results/success”，and known as “a system of deep breathing exercises,”[*] it is a form of meditation and has been used by martial artists and common people for hundreds of years. The image to the right shows the flow of Qi through the body, with the 3 “elixir fields.” These are basically places where energy is stored. 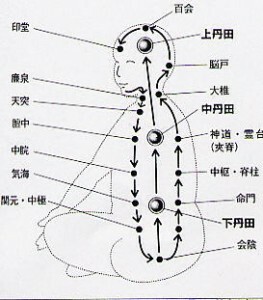 The arrows show how energy flows point-to-point through the body, although it is not always in this direction. Trivia time! Where is the center of the human body? When I was first asked this question I pointed to my naval/waist area. Where did you point? In fact, according to Qi Gong, the center of your body is at your upper lip. Yep, its in your face! This comes from the idea that energy is draped over your body from the top. As I enjoy the Asian diet everyday here, I find that a lot of my Western diet starts to disappear. I only eat toast with peanut butter because I miss home sometimes. I only eat a large hamburger or pizza when I go on a pricey date with my girlfriend. I eat chips with salsa or dip when I’m home for Christmas. Sandwiches have lost their flavor for me. Salad is also flavorless, and is nothing more than uncooked vegetables in my mind. I’m not a health nut, I just like Asian food better.